for the time being, anything is “mox-nix”. twisting stories in all that matters. yanking off their own dog tags. while life runs dry with each heartbeat. while the “faithful” laugh as they scorn the dead. each a hero in his or her own to be. while torn minds and lives can’t mend. for these are things not even truth can tame. IN THE OIL-AND-GAS business, it's called a wildcat well - when a prospector takes a big risk drilling deep in an unexplored area. In 2004, a flamboyant Oklahoma City multimillionaire took out his hefty checkbook for what you could call the political equivalent of a wildcat well - and he struck a gusher, right here in Pennsylvania. The $450,000 in campaign checks -- filtered through an obscure GOP committee - that energy mogul Aubrey McClendon wrote that fall helped elect a man he said he'd never even met, a relatively obscure GOP candidate for Pennsylvania attorney general, Tom Corbett. The hard-charging company run by McClendon, Chesapeake Energy, is the largest and most active driller for natural gas both in Pennsylvania and across the United States - and its environmental record here is under fire for two major well accidents in the past year and allegations from upstate residents of tainted well water. Rosary Acres Natural and Orgainc Foods in Ligonier ,Pa( next to Bull's Tavern)...THE BEST KEEP SECRET! All local and Organic Produce and the largest Bulk Section east of the city. 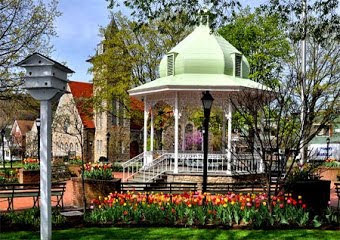 Save time and money traveling to Pittsburgh.....we have the Big City Variety with the great small town values. The Ligonier Valley Historical Society is sponsoring a yard sale on Saturday, August 20th, 8:00 a.m. - Noon in the field behind Compass Inn Museum. A $15 donation per space approximately 12' x 12'. Pass the word to your neighbors and friends. For more information or to reserve your space, call the office at 724-238-6818 or email lvhistory@verizon.net. 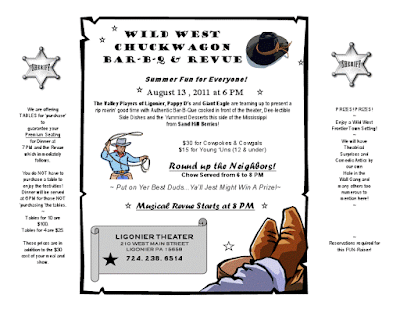 Looking for something to do on the 4th? Tour Compass Inn Museum. Open 1:00 - 5:00 p.m. The Museum and Country Store will be closed Tuesday, July 5th. “Ever since I became the state representative for the 59th Legislative District, I have been calling for reducing spending and getting our financial priorities straight. I am happy to say that we have finally started to build a road that will lead Pennsylvania to being economically competitive. This budget reduces spending by more than $1 billion, combines nearly 100 line-items and also returns $50 million of the legislative surplus. “Through some diligent work, we were able to restore some of the original cuts to higher education and to local school districts throughout Pennsylvania. Given the fact that a $4 billion deficit had to be closed, this is remarkable. We had to reverse and correct the out-of-control spending that has taken place in the past eight years. In that time frame, spending in Pennsylvania increased by $8 billion, an almost two-to-one increase over the rate of inflation. “This new budget was achieved through a dedication of creating a plan with no tax increases and putting an end to irresponsible borrowing, which have been the hallmarks of past budgets. Paul says its unconscionably inappropriate and I agree. It is unconscionably inappropriate to use our website, and the LVSD is the taxpayers' website, for any partisan purposes. Nor is it the purview of the district to attempt to influence policy, in either direction. That is for the citizenry to decide based upon their chosen level of due diligence. This is yet another example of public 'servants' forgetting for whom they work. Additionally, as the district has unfittingly chosen to enter into one side of the debate, one wonders if this is indicative of the methods used to educate the students - by presenting personal elucidations and classifying them as verity. For the record, vouchers will have little to no impact on my life, but this behavior by the school district will be factored into my decision to support or oppose. Had public education systems not so woefully disappointed the voters of the Commonwealth, there would be no debate regarding vouchers. Trials of a new breed of 'super WiFi' that uses the white space between TV channels are set to begin in Cambridge. Microsoft, the BBC, BSkyB and BT are among the tech giants investigating how the gaps in frequencies between TV broadcasts can be used to transmit broadband. Do you really want this same kind of scarring here in the beautiful Ligonier Valley -- to say nothing of the effects of fracking on our air and water? Why would tourists bother to come to a place so altered by this intensively industrial process, why? How much will it depress your property's value? Shouldn't such considerations be as important as someone's right to lease? What about the effects on the Valley as a whole? Have you stopped by MerJo on Main Street lately, the 'local' Artisans have added so many new items to their inventory. Tammy our Creative Card Maker (CCM), has added really cute Pet Cards - both for your pets birthday, and the loss of your pet. She also has created Gift Bags that even includes the tissue paper. What could be easier to wrap those Graduation and Birthday gifts? Bill our jewelry maker is adding more Steeler Jewelry to his line just in time for football camp. Belinda who does the Quilted Wall hangings is getting us ready for July 4th with a lot of Americana Designs. MerJo On Main Street is offering a NEW Service. We are now able to offer Alterations and Sewing repairs. So with all the new items and services - we hope you stop by. Sunday - 12 noon to 4:00 pm. Look at this crew waiting for tasting of new menu! Schmucker apologized to his victims before being led away to serve his sentence. 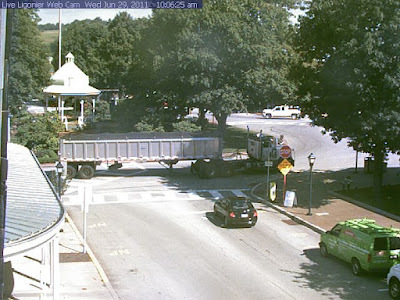 Latrobe man will serve up to 10 years in prison for causing a crash last year that killed his passenger and severely injured another motorist. David A. Schmucker, 21, pleaded guilty on Monday to charges that he was drunk on Sept. 25 when his pickup ran through a red light on Route 30 in Ligonier at about 95 mph and hit a pickup driven by Lara Hoenshell, a Westmoreland County 911 dispatcher who was on the way home after working a 12-hour shift. Did you know your email account may be the most important account you have? When hackers get your email login, they can sit back and watch your email. If they are patient, they will see what banks you use and what friends you correspond with. They will slowly learn your daily habits. When the time is just right, they can strike. The classic email hack is when someone gets access and immediately send email to every person in the address book. They impersonate you, claiming to be out of the country traveling, robbed and asking for a wire transfer. Most of your friends and associates won’t fall for this trick any more. When a smart criminal gains access to email, they don’t immediately act. They sit back and watch a while. Most people book travel online and get the details in email. If they wait to they see you’re on vacation. They can then easily send the email to all your friends and sound very credible. They know where you went, when you left, when you got there. If your friends know you just went to Aruba and the next morning they see an email from you saying you were robbed, are stranded, and need a wire-transfer, they’re likely to run to western union right away. When you lose your password and click “forgot my password”, how is the account reset? For most things they send a temporary password to your email account. If someone has your email account, they can easily start forgetting passwords and getting access to your important things. Luckily, most financial institutions have stopped using email as a primary password reset. But many other sites still use it. If you want an easy way to secure your email, try using 2-step authentication. It’s only offered by a few email providers. Google is the biggest. We have step-by-step directions at Healthy Passwords. Do you have a story to share or good idea on this topic? Please share if you do. There’s been quite a change. When men arrived home from the Viet Nam war in the 1960s, there was no welcome. Today, soldiers return from war to bands and applause. 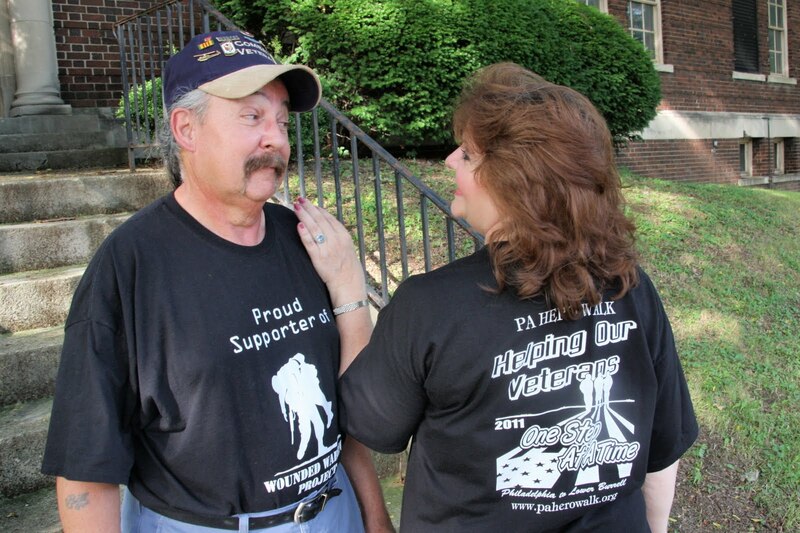 The reception Ligonier gave to the walkers participating in the Pennsylvania Hero Walk showed that patriotism is n ot just a word to local residents. It showed that patriotism was alive and well in this community. 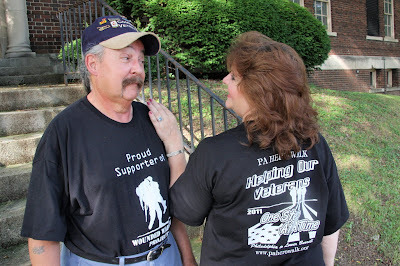 Cathy Rhodes and her brother, a Viet Nam veteran, walked through Ligonier with the Pennsylvania Hero Walk participants. Cathy also sang at the American Legion hall. 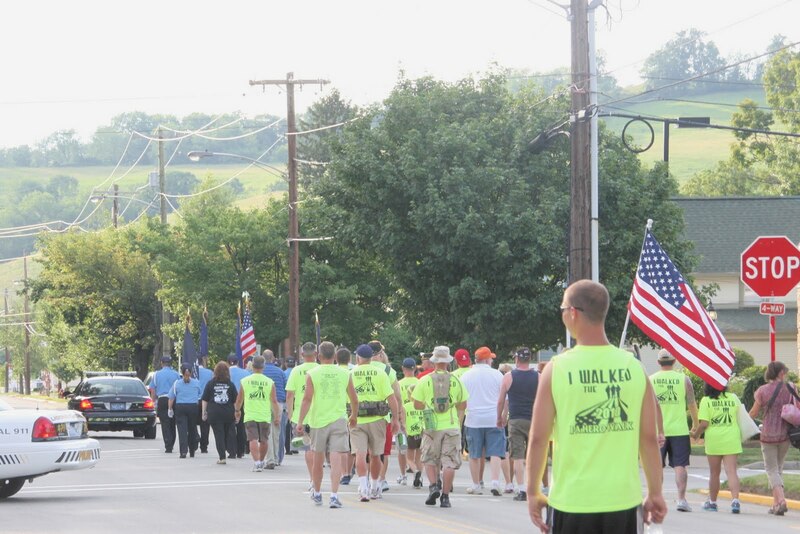 The Pennsylvania Hero Walk participants at the end of their Ligonier in-town parade nearing the American Legion hall. what about all those out of town contractors??? 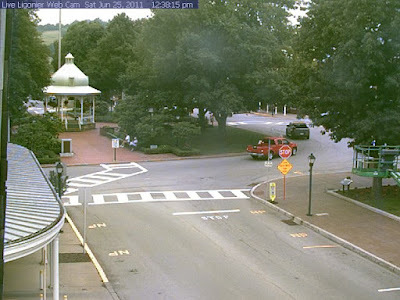 I appreciate all the content you provide on the Ligonier Living blog and have enjoyed how the community is embracing the venue you have provided to share information of all kinds. One topic that I think would be of value for everyone to discuss is the influx of out of town contractors who have come in to “help” us all with our hail damaged roofs. 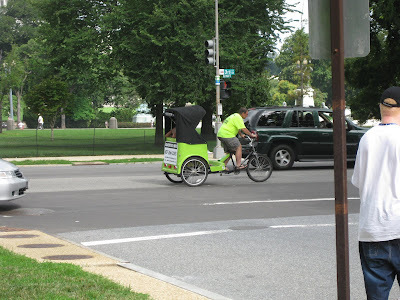 Now I don’t begrudge an entrepreneur taking advantage of an opportunity to keep his business healthy by going where the work is…. But if we have the work done by one of these companies from out of state, where will they be next year if a leak appears or the gutters fall off after the first snow? I would appreciate hearing about others experiences so that we can make an informed decision. I am using Angie’s List and doing as much research as I can but I would love some recommendations from those that have had good experiences and think it would be of value to all to hear the horror stories. Terrific topic, Dawnmarie. 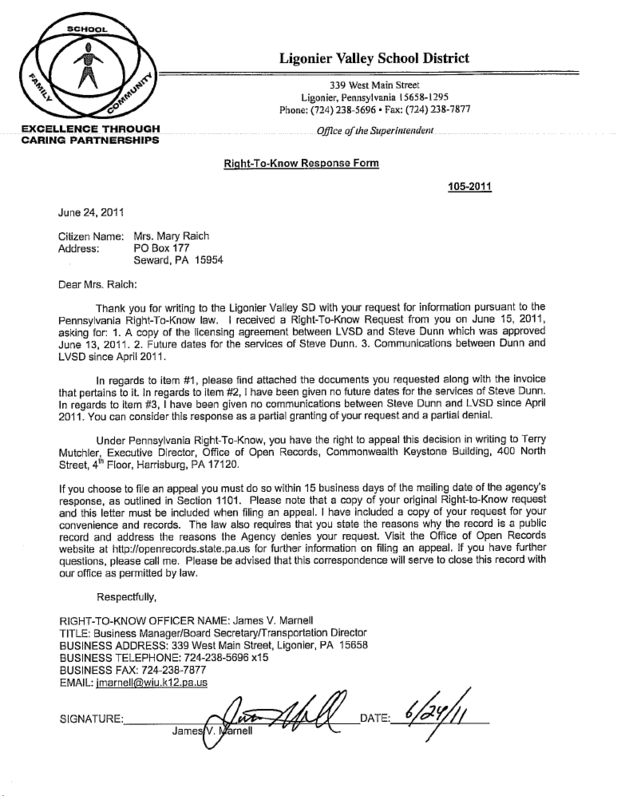 Ligonier Borough has a required soliciting permit. Ask to see it before you even talk with someone who is soliciting your business. I know local contractors are overwhelmed this season. We've been trying to get some work done ourselves and can't even get an estimate from the contractor we normally use. We did hire another contractor who started our work and then WAS INTERRUPTED BY ONE OF THE HOUSE TOUR PEOPLE WHO DECIDED THE WEEK BEFORE THE TOUR TO INSTALL WALKWAYS, ETC AND FOR WHATEVER REASON OUR WORKERS ALL WENT THERE TO HELP WITH THE SO CALLED EMERGENCY. Now we are in LaLa Land with an unfinished torn up house because that false emergency was followed by a real emergency of illness in the family of the contractor. We won't hire one of the out of town companies so we'll wait. We have some hail damage but we can't get to that work until this other work is done and there are others projects to finish but everything is on hold while we wait for someone to show. It's not like we can switch contractors because everyone has so much work. What a crazy year. 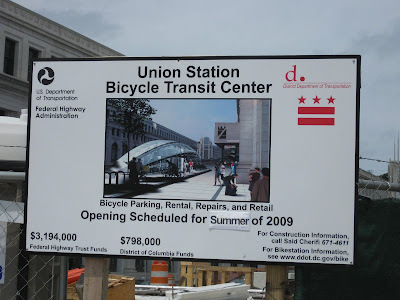 I am happy that at least the automobile folks and housing contractors have work. That's good for everyone. I would be very interested to hear the response from the consulting firm who drafted the zoning ordinance on the subject of real estate open house signs. 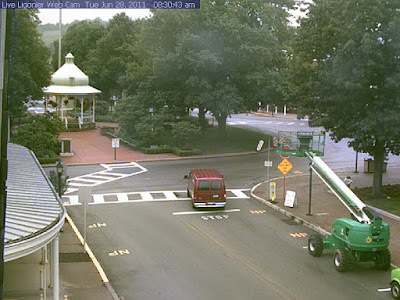 It seems to me that this consulting firm carefully included provisions that the Ligonier Borough Council can approve any temporary signs they so desire. This carefully included language means that the law does not have to be amended each time a new temporary sign need arises. I do hope that planners will consider the powers already included within the existing zoning ordinance and turn the matter back over to the council to manage case by case as residents make requests for such open house signs. Ligonier planning commissioners voted on Monday night to recommend borough council approve a new bakery at 335 W. Main St.
Ligonier residents Lynn Thomas and Malinda Smidga will run the shop, which will specialize in gourmet bagels and cake pops, Smigda said. Observer raised this issue in a recent comment. "Not related to this post but look at the LVSD web site for a surprising link to the Pennsylvania legislature Democratic Party caucus. 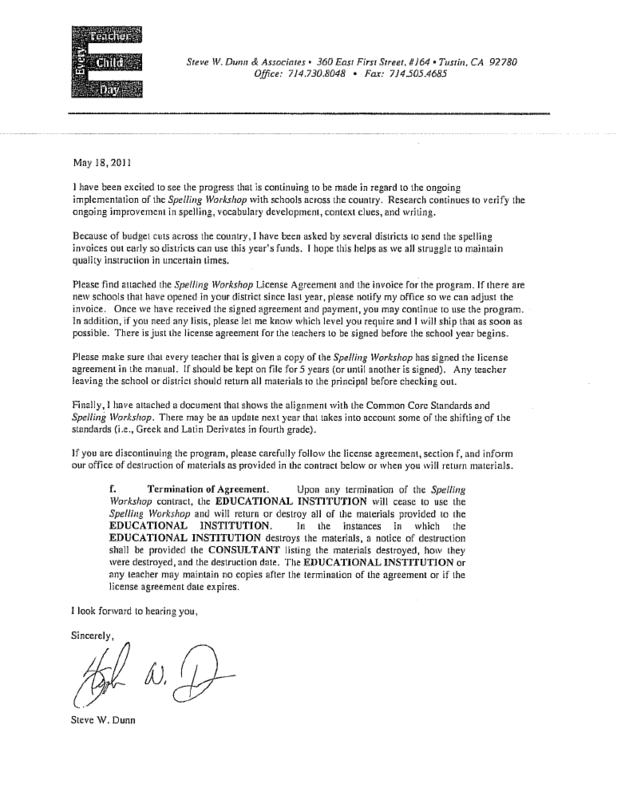 Apparently someone in the LVSD administration is openly anti-vouchers and openly pro-Democrat. That same person also can't spell "caucus." They spell it "caucas" on the LVSD web site." Visit the official school web site to see the link in latest news. I AM PERTURBED THAT THE PUBLIC SCHOOL MY TAX DOLLARS SUPPORTS IS SPENDING TIME ON THE PUBLIC CLOCK AND WITH THE PUBLIC WEB SITE TO LOBBY FOR AN ANTI-SCHOOL CHOICE POSITION. And BTW, no wonder the school district is spending so much money on Steve Dunn's literacy and spelling programs. Apparently these skills are beyond the ability of the LVSD administration and teaching staff who ought to be capable role models for the student body. Great summer job for a person trying stay fit. This would be perfect at the old train station. A double-decker bus would be fun! I'd love to see this in the Borough. "Cities including Vienna to Munich and Copenhagen have closed vast swaths of streets to car traffic. 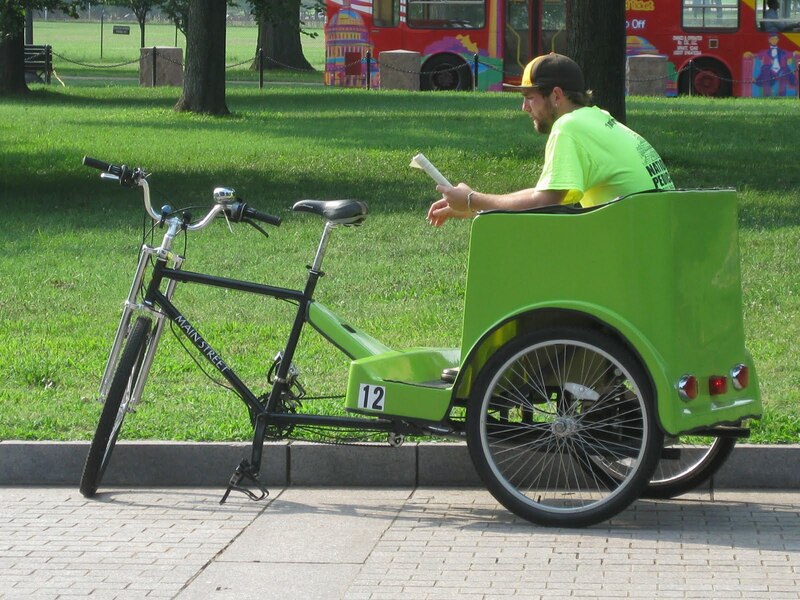 Barcelona and Paris have had car lanes eroded by popular bike-sharing programs. Drivers in London and Stockholm pay hefty congestion charges just for entering the heart of the city. And over the past two years, dozens of German cities have joined a national network of “environmental zones” where only cars with low carbon dioxide emissions may enter." 'Around Löwenplatz, one of Zurich’s busiest squares, cars are now banned on many blocks. 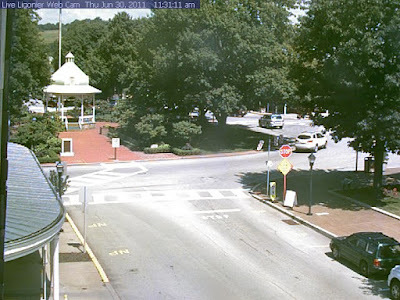 Where permitted, their speed is limited to a snail’s pace so that crosswalks and crossing signs can be removed entirely, giving people on foot the right to cross anywhere they like at any time. Similar stories of people helping one another, often without being asked and demanding nothing in return, were a heartwarming counterpoint to the destruction from unprecedented flooding along the Souris Valley in north-central North Dakota. Brought together by word of mouth, church and civic networks, social media and random encounters, those with housing and supplies to spare gave willingly to those without. A new coalition of outdoors groups is emerging as a potent force in the debate over natural gas drilling. The Sportsmen Alliance for Marcellus Conservation isn't against the process of fracking for gas, but its members want to make sure the rush to cash in on the valuable resource doesn't damage streams, forests, and the various creatures that call those places home.The movement grew out of grass-roots anger as passionate outdoorsmen found their questions about drilling and wildlife brought few answers from local or state officials. There has been considerable public debate over how and if fracking impacts drinking water supplies, but sportsmen are worried that even low concentrations of fracking chemicals may affect aquatic invertebrates – the tiny water bugs that grow into mayflies and stoneflies, which are in turn eaten by fish and birds. The sportsmen worry that a stream without bugs could quickly become a stream without fish, and then a valley with fewer birds, and so on up the food chain. She said Dan Fogarty, director of the Pennsylvania Center for Advanced Manufacturing Careers, said that skilled technicians, such as machinists, are in demand across the state and that advertisements for semi-skilled production positions is 37 percent higher than a year ago. 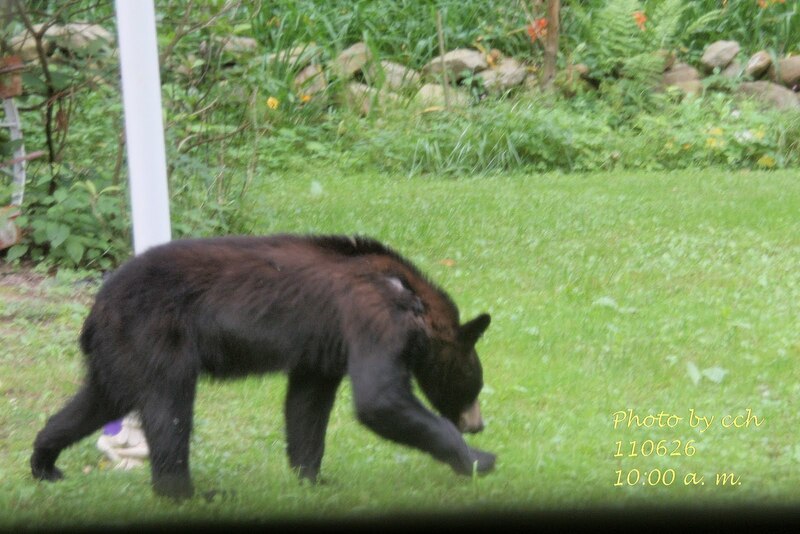 From Carolyn: Guess who came for a mid-morning snack on Sunday? My neighbor Emma called me to tell me I had a bear in my yard. 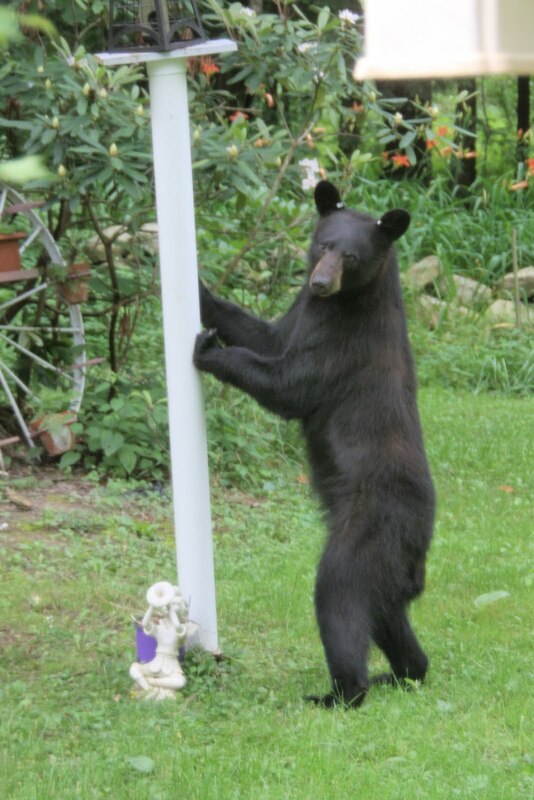 The bear is thinking about knocking down our squirrel-proof bird feeder. I seem to be posting all about God’s good creatures this past week. Bird Attack! Dive bombing birds attack humans! 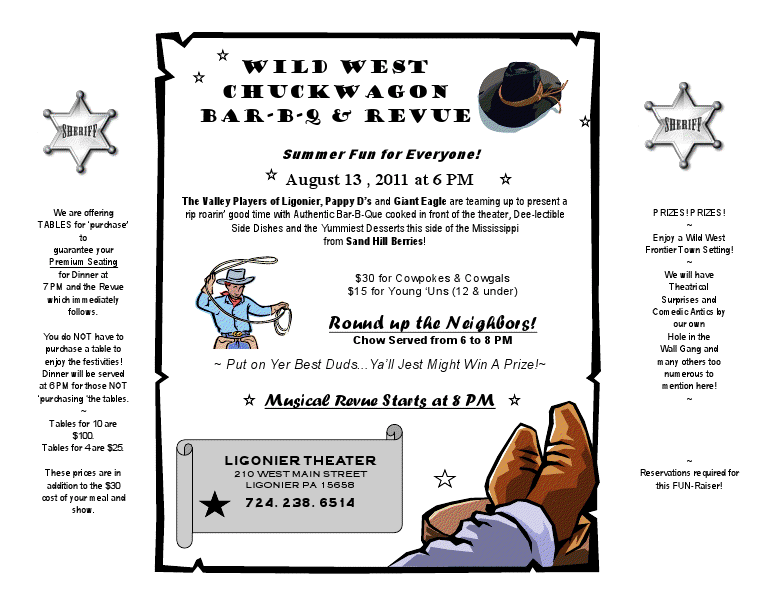 JUNE 27: Nickers and Neighs Therapeutic Riding Center will be holding a four person scramble golf outing on June 27th at the Ligonier Country Club. Registration begins at 9 AM and the event begins at 10 AM with lunch and prizes to follow. For more information, call 724-771-1966. 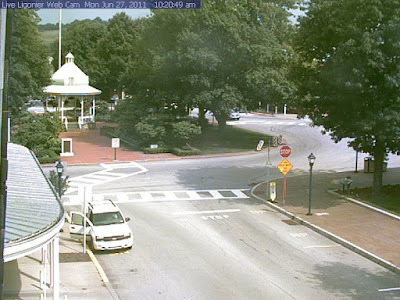 JULY 22-23: Summer in Ligonier Arts and Crafts festival will be held along the Diamond on Friday and Saturday, July 22nd and 23rd...from 9- 5pm. There will be entertainment, food, sidewalk sales and arts and crafts for children. JULY 30: The Southern Allegheny Museum of Art at Ligonier Valley is offering two exhibitions that celebrate the natural landscape..Seasons of the Landscape and Nature in 2 1/2 Dimension. These works will appeal to any nature lover. Come see them..on display now through July 30th. 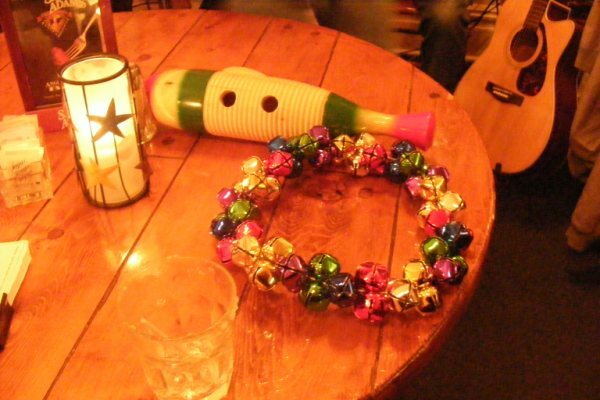 Café Nights – Under the Stars! The Tribune Review discusses 2 school districts in our area this week. First, Yough School District with a similar budget to LVSD of 28.6 million reduced millage by 2 and has 5.1 million in the reserve fund. 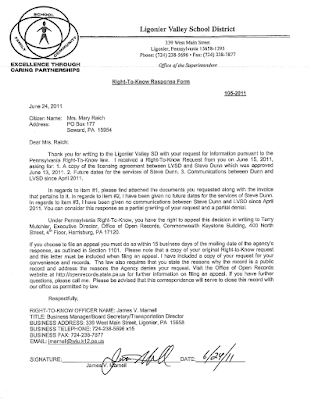 The Derry School District which is right next door did not raise taxes. The LVSD's board claims that the other school districts are in the same boat. Mr. Tantlinger frequently cries that the pension fund and the health costs have contributed to the financial woes of the district. Youg discusses the same issues, but somehow it did not hinder them from addressing sound fiscal responsibility.The LVSD's board members with Dr. Oldham need to consult those board members and their superintendents for advice. How were those school districts able to locate such leaders who have demonstrated fiscal responsibility with sound educational initiatives? See the dog at the base of the statue? Her name was Sallie Ann Jarrett. January 1864 marked the expiration of the term of enlistment for William Ferguson Leslie of the Ligonier Valley and the rest of the original three-year enlistees of the 11th Regiment of Pennsylvania. Out of patriotism and devotion – as well as a generous bonus – more than three-fourths of the men re-enlisted as veteran volunteers. Are You Trading Convenience for Security? You’re at a website and want to participate. You have a choice to create a new account or use Facebook to login. Which do you choose? If you’re like most people, you pick the easier way. According to research by unsubscribe.com users use Facebook to login at third-party sites, every three days. This grants long-term access to more than you think. From an authentication (user name / password) perspective, fewer logins means fewer places your email and password are stored. Using one password is better than leaving breadcrumbs all over the internet waiting for the next big breach, isn’t it? By granting access to third parties you legally give corporations access to your data. Besides being a dream for marketers, this type of access can also add additional cross site scripting vulnerabilities to your linked social network account while on the third party site. Most apps only can access your data while you’re at their site, but some apps require “Access My Data at Any Time”. It’s a tough decision. Businesses are being compromised at alarming rates. A recent New York Times Blog Post sites a new Ponemon Institute survey of 581 security professionals broadly agreeing that cyber attacks are getting more frequent, more severe, and harder to detect and stop. Ponemon also shows that many breaches are caused by human error. Too much access increases risk. Most people use a single password for multiple logins, exposing them to potential loss. Creating an account at every site you contribute to multiplies this risk. On the other hand, Facebook and Twitter have adequate staffing to secure user credentials. They’re not infallible, but they are less likely to lose your password than many other sites. What’s a good balance? Two options are: Login using the social network credentials, and revoke access after your done (instructions for this are at Healthy Passwords). Use a password manager to generate unique passwords. We don’t advocate using password managers for high risk sites, but they can be a good tool for low to moderate risk sites. Just be sure to look at password manager reviews before choosing one. looking for a job with a chance to see the Steelers up close and personal? St. Vincents needs food service help ASAP. They are taking applications now. If you can move tables and equipment, you may not need prior food service experience. Stop out today. I've been using Google's Blogger for years but I never noticed that you can create a web site for free on Google. I know many small business owners have Facebook pages but not everyone uses Facebook. If you want to reach a wide demographic, you need a web presence as well as a Facebook presence. Google provides templates that you can customize. I tried it this morning. It's not too tough. If you can figure out how to create a page on Facebook, you can build your own web site AND you can add features not available on Facebook. If you already have a Google Site, please share a few comments. I'm very interested. Attached is a copy for a recent RTK concerning Steve Dunn. 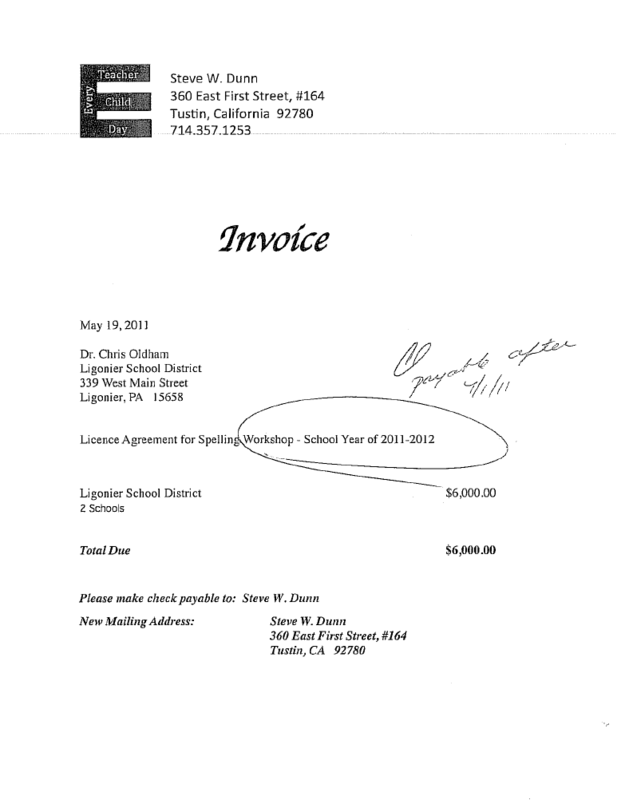 Included is an invoice to LVSD for the Spelling Licensing Agreement of $6,000. This is an annual expense. 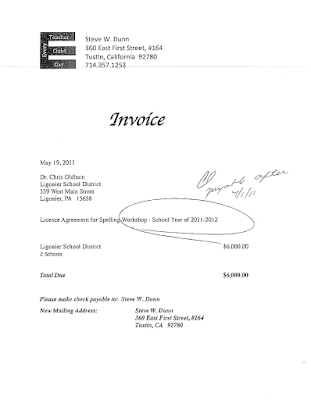 Now the total LVSD has spent is approximately $180,000 on his program and services. (over 1 mill). 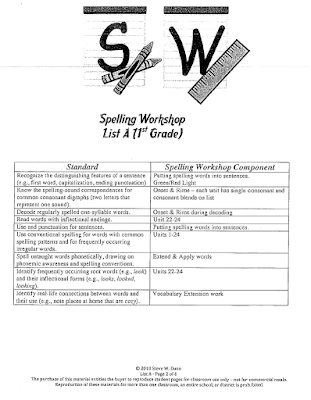 In addition, teacher's must sign a document stating that they are not even allowed to present the workshop formats or content of the Spelling Workshop to other teachers within or outside the district. 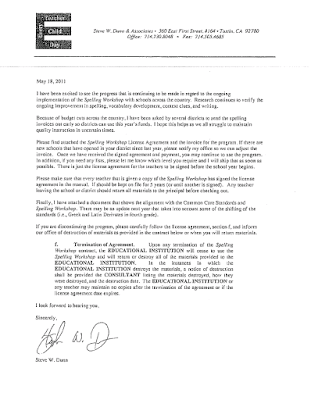 Since there are moves made within the district due to layoffs, leaves, and retirees, a teacher who is moved into a position that uses the Dunn materials will have to be trained by Mr. Dunn according to his agreement. Thus, we can watch for Dunn's return. Mary: I am posting portions of the RTK. If folks want to see more, just comment and I can post it through Scribd. As a member of the Fort Ligonier Association, I would like to register my appreciation for the outstanding job Martin West has done over the years to turn the fort into a first-class historical site and museum ("Martin West, Fort Ligonier's longtime director, retires," June 1 and TribLIVE.com). It is now the very best place to understand and appreciate the Seven Years War, of which the French and Indian War was a part. The exhibits he created also allow us to better understand the significance of the Forbes Expedition to capture Fort Duquesne. A mineral mining company is seeking permission from the state Department of Environmental Protection to extract 13 million tons of Loyalhanna Limestone from Fairfield property beyond Yeager Hollow Road. ROSARY ACRES natural and organic foods. Stop in for a FREE reusable tote bag(with purchase) and a sample pint of the BEST RAW MILK you have ever tasted. Fresh delivery of produce in tonight.....A variety of local Amish goodies from the garden. Organic Fruits...Pineapples...Pink Lady Apples...Bananas.....Strawberries....Watermelons....Lopes....Melons and more! Get in early to get the pick!...opening at 8:30 am Saturday. 4000 SQ FT of Big City Variety without the travel....Come and see for yourself. An extra large bulk section with grains, teas, spices and candy. "Bring the Olde Time General Store to your Door"
FIFTEEN. Say 'god bless you' when you hear someone sneeze. SEVENTEEN. Remember the three R's: Respect for self; Respect for others; and Responsibility for all your actions..
Methinks Diana looks better in my hat then I do. 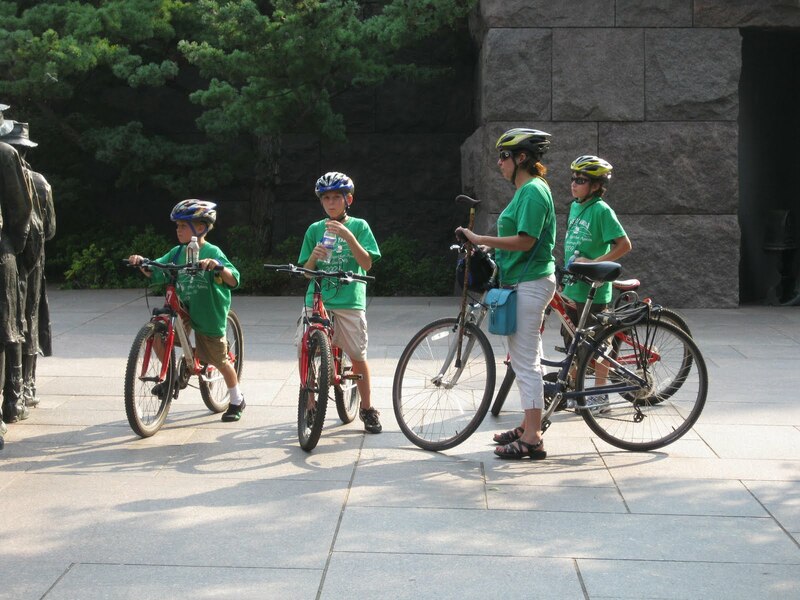 Learn more on June 25 at the Kid's Bike Rally. 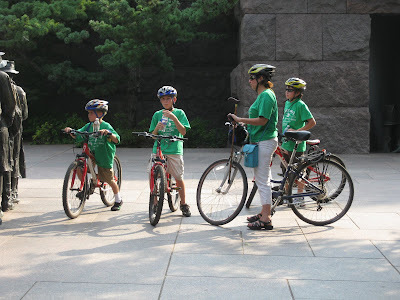 Get a helmet for kids 4-12 if with a bike and an adult. 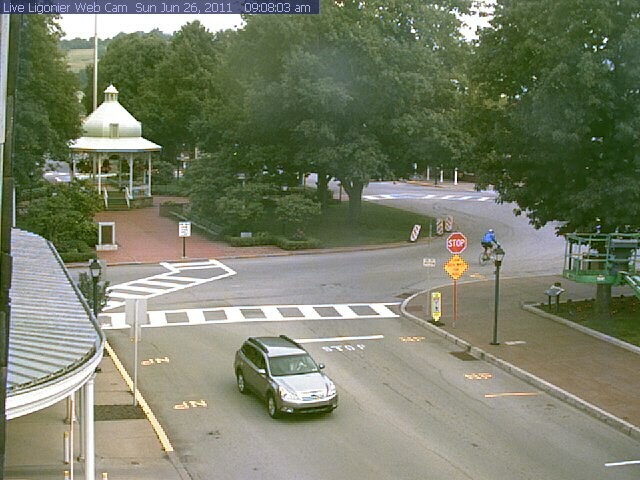 50 available to the first eligible attendees..
1-3PM at the Ligonier Township Municipal Building. We already have students enrolled in our 2011 Camp! This year, the instructor will have his students put on a STAGE PLAY which will include ALL students, so tell your friends and neighbors to come and join in the FUN this year!! The dates will be July 5 through 15 from 9 AM to 12 noon, with a performance on July 16 at 11 AM. 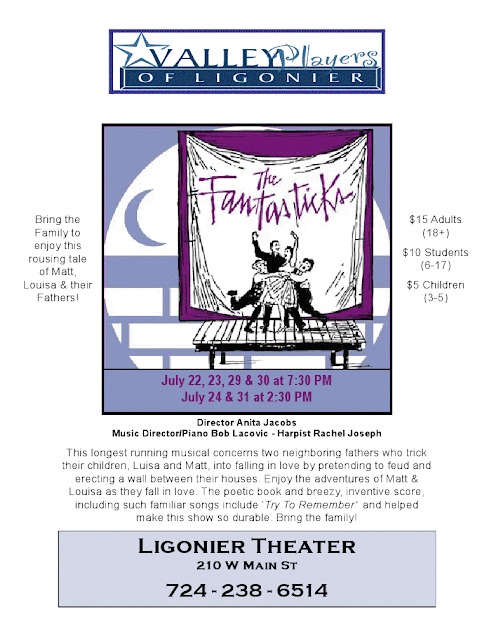 AFTER THE SHOW, THE STUDENTS WILL ENJOY A CAST PARTY AT THE YMCA IN LIGONIER WITH SWIMMING AND PIZZA ! $25 Enrollment fee & registration completed by June 25, 2011. $125 remainder due by the first day of Camp. Call our office for more info: 724-238-6514. Back in April, the Chesapeake gas well on the Morse's property blew up, spilling thousands of gallons of flowback fluid into the ground and nearby creek. On Thursday, federal environmental officials visited some homeowners in Bradford County to share with them the results of the EPA's own tests on the water. EPA officials sat down with Randy and Kay Morse at their home in LeRoy township with test results on their private water well. The Morses said the EPA's testing confirmed what they already knew: that high levels of sodium showed up in their well. The couple is still drinking bottled water as a precaution. Robert C. Sanzi, 66, of Latrobe, passed away Thursday, June 23, 2011, in UPMC Presbyterian Hospital, Pittsburgh. He was born Oct. 7, 1944, in Latrobe, a son of Claire (Austraw) Sanzi, of Ligonier, and the late Adolph N. Sanzi. Prior to his retirement, Bob was employed by General Motors with 32 years of service and was a Vietnam veteran having served with the Army. He was a member of Trinity Evangelical Lutheran Church in Latrobe, the Laurel Highlands Model Airplane Club, the Westmoreland Photographers and the Beanery Writing Group. He also loved to ride his motorcycle and was a lifelong model train enthusiast. In addition to his mother, he is survived by two daughters, Dawn Sanzi, of Sterling Heights, Mich., and Donna Suiter and her husband, Kelly, of Lenox, Mich.; two grandchildren, Riley and Josie Suiter; his loving companion of seven years, Nancy Beaufort; a brother, Mark Sanzi, of California; and numerous aunts, uncles and cousins. Friends will be received from 6 to 8 p.m. Friday and from noon until 1 p.m. Saturday in the HARTMAN-GRAZIANO FUNERAL HOME INC., 1500 Ligonier St., Latrobe. Funeral services will be held at 1 p.m. Saturday in the funeral home chapel with the Trinity Lutheran pastors officiating. Interment will be private. In lieu of flowers, memorial contributions may be made to the Trinity Evangelical Lutheran Church, 331 Weldon St., Latrobe, PA 15650. Condolences can be sent to hartmangrazianofh<\@>comcast.net. In celebration of our 10th anniversary, The Sewickley Spa at Ligonier will host an open house on Friday July 1, 11:00-5:00. Please stop by for refreshments and prizes, and allow us to say thank you for your support since 2001! 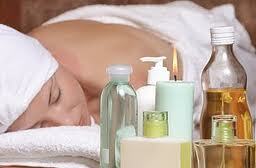 Please see our anniversary special, for Ligonier clients only, at www.sewickleyspa.com.